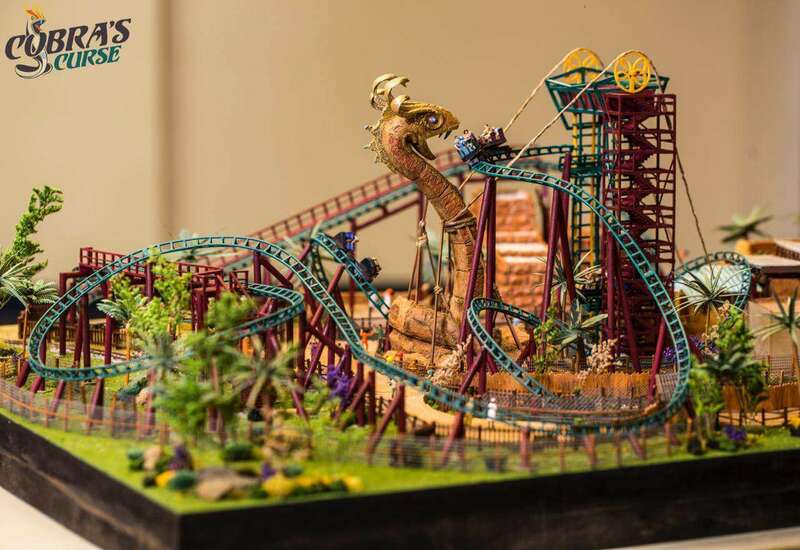 New details released at the IAAPA press conference for Busch Gardens Tampa’s Newest Coaster, Cobra’s Curse! 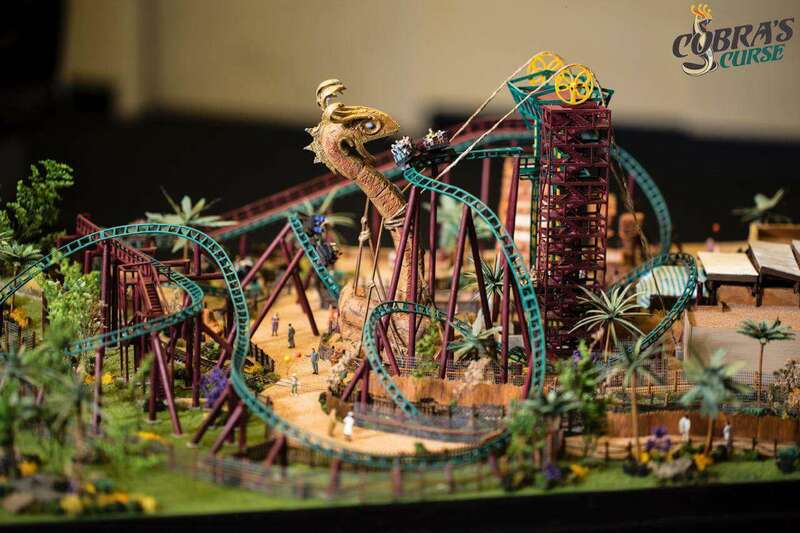 Busch Gardens Tampa provided additional details about the latest thrill ride project coming in 2016, including a detailed model revealed at the International Amusement Parks and Attractions show in Orlando. 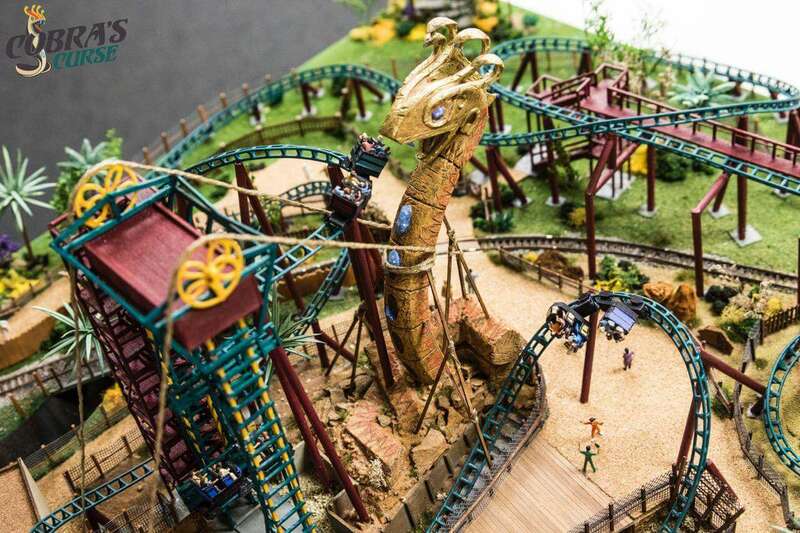 Cobra’s Curse will be the only ride of its kind in the world: a family roller coaster with freely spinning ride vehicles and a 70-foot vertical lift. As a special incentive for Florida residents, the new details were revealed as the park is promoting a special offer for advance purchases of the 2016 Fun Card. For the price of a single-day admission, guests who purchase their 2016 Fun Card now also will receive the rest of 2015 free. A unique move on Cobra’s Curse is the “outward-banked turn” that puts riders perilously close to the jaws of the monstrous, 80-foot-tall statue of the snake king Venymyss. This turn can be seen here. Instead of a gradual lift hill, more typical of a traditional coaster, each train is instead lifted vertically, to a height of 70 feet, and the top of the ancient temple. During the three-and-a-half-minute ride, the coaster trains speed along at 40 mph, spinning backward, forward and then freely. The ride’s setting is a modern day dig site in Egypt, where archeologists have uncovered the legendary temple of the snake king, Venymyss. The ride’s air-conditioned queue line provides a welcome break from the Egyptian heat. Get a sneak peek of Florida’s newest and most exciting family thrill ride on the Busch Gardens YouTube channel. Visit CobrasCurse.com for more information. Or, be the first to know about new events, special deals and future announcements by following the park’s blog at buschgardenstampablog.com, or “Like” the Busch Gardens Facebook page and follow @buschgardens on Twitter and Instagram. Previous Post WWE Gives Away Over $180,000 in Scholarships To Full Sail University! Next Post Emeril Lagasse at Dr Phillips Moved To April 2016!